Breathlessness or dyspnea (the sensation of shortness of breath) is common with lung cancer and often worsens with advanced disease. The sensation of shortness of breath can be frightening, and many people fear what will happen if their disease progresses. An important part of managing this symptom is determining the cause of any change, as there are many potential reasons (not just lung cancer alone) why this may occur. Treatment options will depend on the underlying cause or causes but may include medications such as morphine, oxygen therapy, breathing exercises, mind/body therapies, and much more. When talking about shortness of breath, it's important to distinguish the sensation of feeling short of breath from physical signs that imply shortness of breath, such as a rapid respiratory rate and low oxygen saturation levels on oximetry. Doctors use the term dyspnea to describe the sensation of being short of breath. This sensation may be described as the feeling of being unable to get enough air, feeling uncomfortable with breathing, chest tightness, or a feeling of being smothered or suffocated. While dyspnea is a subjective measurement, it's a very important measure, one that is sometimes referred to as the sixth vital sign. The sensation of breathlessness (dyspnea) doesn't always reflect the oxygen content of the blood or the degree of oxygen being supplied to the tissues of the body. Sometimes people can have very low oxygen saturation levels, but not feel short of breath. Similarly, a person may feel significant significant shortness of breath even if oxygen levels are normal. Dyspnea may be present at rest or only with activity. If you are only feeling short of breath with activity, your doctor may ask you to describe the amount of activity. For example, whether you become short of breath with walking only a few feet, or if you only become short of breath after walking a few blocks down the street. Understanding the degree of dyspnea is very important in providing the best care but is challenging as everyone is different. To objectify this sensation, dyspnea scales have been devised to help doctors assess dyspnea, and to monitor progress with treatment. In contrast to the symptom of dyspnea, there are several objective measures that can help assess the function of the lungs, and the ability of the lungs to provide oxygen to the tissues of the body. A rapid respiratory rate (tachypnea): A normal respiratory rate at rest is 12 breaths to 18 breaths per minute in an adult. An increased rate is referred to as tachypnea. Another term, hyperpnea, is used to describe breathing that is abnormally deep and appears labored. While physicians often think of heart rate and blood pressure as the more important vital signs, the respiratory rate has actually been found to be more important in predicting prognosis in people who are in the intensive care unit. Lung cancer can lead to shortness of breath in a number of different ways. Since some of these may be treatable, it's important to talk to your oncologist about any shortness of breath you experience, even if you think there is a logical explanation. One of the more common reasons for increasing shortness of breath with lung cancer (either the sensation of dyspnea or objective measures of respiratory distress) is the growth of the cancer in the lungs (tumor progression). Surgery for lung cancer, such as a lobectomy, pneumonectomy, or wedge resection, results in less lung volume. Scarring after surgery, and especially after radiation therapy can be ongoing for up to two years, and symptoms may worsen even months after your treatment. Fluid can build up between the pleura, the membranes that line and protect the lung. When a significant amount of fluid builds up, it compresses the lungs, reducing the amount of oxygen that can be delivered to the alveoli where gas exchange takes place. The fluid can be benign or contain cancer cells (malignant pleural effusion). Fluid can also build up between the membranes that line the heart (pericardial effusion). The pressure from a pericardial effusion can compress the heart, reducing the volume of blood that is pumped through the body, and therefore, the amount of oxygen supplied to the tissues. When a tumor grows in or near one of the large airways, its growth can obstruct the airway leading to worsening breathlessness. Lung infections such as pneumonia are common with lung cancer, and sometimes the only clue to their presence is worsening shortness of breath. Pneumonia commonly occurs when a tumor partially obstructs the airway, but is also common due to immunosuppression, such as for those who are receiving chemotherapy. Inflammation of the lungs, called radiation pneumonitis, is a common side effect of radiation therapy for lung cancer. It's important to treat radiation pneumonitis since it can otherwise progress to pulmonary fibrosis. The diagnosis can usually be made based on x-ray findings. Unfortunately, the symptoms of radiation pneumonitis overlap with symptoms of lung cancer and can be easily missed. People with lung cancer, especially lung adenocarcinoma, have a significantly increased risk of developing blood clots in their legs (venous thrombosis). These clots can then break off and travel to the lungs (pulmonary embolism). Symptoms may be dramatic, with severe shortness of breath and chest pain, or very mild, with only mild worsening of breathlessness. Pain, swelling, redness, or tenderness in the calves may also be noted. Pulmonary emboli are common, and many people with advanced lung cancer require lifelong treatment with blood thinners after these emboli occur. Unfortunately, as with many conditions here, the symptoms overlap with common symptoms of lung cancer and be easily overlooked in mild cases. Anemia related to chemotherapy, other treatments, or simply due to having cancer (anemia of chronic disease) can cause shortness of breath and worsen pre-existing shortness of breath. When fewer red blood cells are available to transport oxygen to tissues of the body, anemia can compound reduced oxygenation related to lung disease. A complete blood count can detect anemia. There are many potential causes of anemia with cancer, and many of these, in turn, are treatable. Many of the medications used to treat lung cancer or to control the symptoms caused by lung cancer can cause allergic reactions. With an allergic reaction, breathlessness may be accompanied by swelling of the face, neck, mouth or tongue, a rash, or feelings of lightheadedness. Having uncontrolled pain can easily worsen breathlessness. Anxiety, like pain, can worsen breathlessness and breathlessness can, in turn, increase anxiety. Obesity can exacerbate shortness of breath when the pressure from the abdomen restricts the amount of air that can be drawn into the lungs. Many people with lung cancer also have conditions such as COPD, congestive heart failure, asthma, hypothyroidism, and other conditions. Worsening of these other conditions can sometimes be masked by the symptoms of lung cancer, and it's important to talk to your doctor about any medical conditions you have. New medical conditions other than lung cancer may also be responsible for increased shortness of breath. It's sometimes easy to forget that people living with lung cancer are just as likely (and more due to side effects of chemotherapy and radiation therapy) to develop problems such as heart disease. If you are noticing increased shortness of breath, there are a number of tests your doctor may order. The first step is often oximetry to check on your oxygen saturation. Arterial blood gases may be checked and can provide further information. 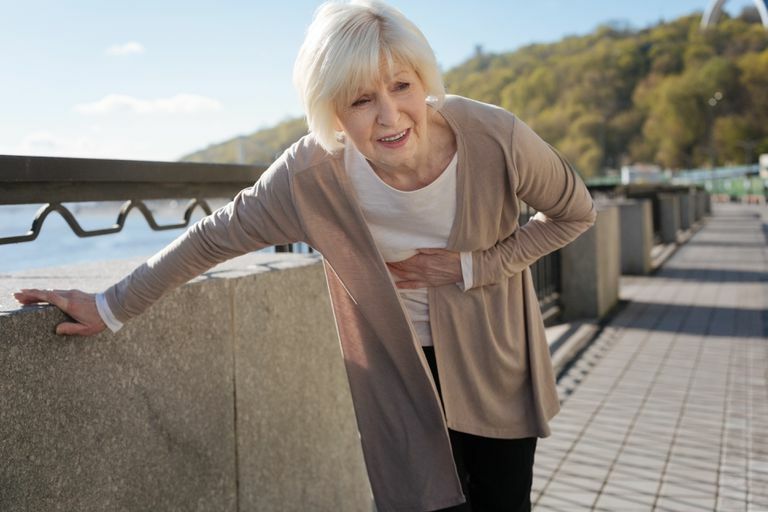 Shortness of breath may occur not only due to decreased oxygenation of the tissues (hypoxia), but due to increased carbon dioxide (hypercapnia), or acid-base imbalances in the body. Blood work, including a red blood cell count and hemoglobin, are important. Radiology studies often begin with a chest x-ray. Further tests may include a chest CT (that can give more information than a chest X-ray), or a VQ scan (if a pulmonary embolism is suspected). If there is a possibility that a tumor is obstructing your airway, a bronchoscopy may be done. The treatment of breathlessness focuses on both reducing shortness of breath and managing the anxiety that breathlessness can cause while looking for potential underlying causes. If your symptoms are mild, your oncologist or primary care physician may manage your symptoms. Many cancer centers now, however, provide palliative care consults with a special palliative care team. These teams, led by a palliative care doctor, focus on managing the symptoms of cancer, such as breathlessness, to improve quality of life while living with cancer. Both opioid medications (such as morphine) and anti-anxiety medications can reduce the sensation of shortness of breath. Conditions such as COPD are common in people with lung cancer. Treatment of these conditions with inhalers, nebulizers, and other treatments can be helpful. When a lung tumor grows into the airway, it can cause shortness of breath, as well as infections (due to the obstruction) and increases the risk of bleeding. Sometimes a stent will need to be placed to bypass the obstruction. Radiation therapy can be very effective (and rapid) for treating cancer at the site of obstruction and improving symptoms. Large pleural effusions can cause significant shortness of breath, especially with advanced lung cancer, and it's not uncommon for a few liters of fluid to have accumulated. In a procedure called thoracentesis, a doctor inserts a thin needle through the chest wall and into the pleural cavity to drain the fluid. Unfortunately, the fluid often recurs, but there are techniques to deal with the recurrence. Sometimes a stent is placed from the pleural cavity to the outside of the body so that excess fluid can be removed by at home. In a procedure called a pleurodesis, a chemical such as talc is inserted between the pleural membranes, causing them to scar together. This obliterates the pleural cavity so that fluid cannot accumulate. Pericardial effusions are managed in a similar way, via a pericardiocentesis (inserting a needle into the pericardial cavity and withdrawing fluid). As with a pleural effusion, the fluid may re-accumulate and may need to be treated with a stent to drain the fluid, or removal of part of the pericardium (pericardiectomy). Oxygen therapy, either continuous or intermittent may be needed if your oxygen saturation is low. The use of portable oxygen therapy has improved dramatically over the last few decades, and many people can live active lives despite the need for oxygen. For those who have conditions such as COPD along with lung cancer, oxygen therapy may improve survival. If shortness of breath appears to be related to treatments such as surgery or deconditioning, your doctor may suggest trying pulmonary rehabilitation. Pulmonary rehabilitation is a relatively new therapy when it comes to managing lung cancer, but may be helpful for many people. Since this is relatively new, people may need to initiate the discussion about its potential benefits with their physician. In addition to medical treatments, there are a number of things people can do themselves to cope with the feeling of breathlessness. Since dyspnea can greatly impact your quality of life, it's helpful to consider these approaches along with traditional medical treatments for your symptoms. It's fairly obvious that people who are experiencing breathlessness should avoid smoking or secondhand smoke, but there are other air quality issues that can be just as important. We often think of outdoor pollution, but indoor air quality can have as great an effect or more on your breathing. Steps to improve your indoor air quality can include reducing dust and pet dander in your home, avoiding toxins such as those found in common household cleaners, paints, and varnishes, and making sure your home is properly ventilated. Some people find air filters helpful as well but avoid air fresheners (which work by exhibiting a small that masks odors). Having a standing or hand-held fan to circulate air is very helpful for some people. Infections such as the flu and pneumonia can worsen shortness of breath. Reduce your risk of infection by careful hand washing (and making sure friends and family wash theirs as well), avoiding crowded places (especially during flu season), and making sure you are up to date on your flu and pneumonia vaccinations. Additional precautions are important to reduce your risk of infection during chemotherapy. Small amounts of mild to moderate exercise can be very beneficial in improving your breathing and reducing shortness of breath. Staying well hydrated is important in order to reduce mucus in your airways, especially if you are using oxygen. Some people find that dairy products can worsen their shortness of breath due to thickening of secretions. Eating a smaller meal more often, and eating small bites of food at a time can also be beneficial. Many people find that their shortness of breath increases significantly with lying flat. Sleeping at a 45-degree angle may help. Using a wedge pillow, instead of struggling with normal pillows can make this easier. Sleeping in a cool room can also improve breathing. Breathing techniques and exercises can be very helpful, especially if you also have a condition such as COPD. Breathing slow and deep in through your nose and out through your mouth with pursed lips (pursed lip breathing) is helpful for many people. Diaphragmatic breathing is somewhat more difficult than pursed-lip breathing but is effective for some people. Stress clearly worsens the sensation of breathlessness and can interfere with your well-being in other ways as well. Relaxation exercises, such as progressive muscle relaxation are helpful, as well as practicing healthy stress management in all areas of your life. There are a number of integrative cancer treatments that may help not only with shortness of breath, but other symptoms of cancer such as fatigue, pain, neuropathy, and more. Many cancer centers now offer therapies such as acupuncture, massage, yoga, meditation, and even music therapy. Williams, A., Grant, M., Tiep, B., Kim, J., and J. Hayter. Dyspnea Management in Early Stage Lung Cancer. Journal of Hospice and Palliative Nursing. 2012. 4(5):332-340. American Society of Clinical Oncology. Cancer.Net. Shortness of Breath or Dyspnea. Updated 08/16.